The after effects of Namewee’s recent 4896 concert remain indelible in my mind. As a self-confessed ang moh pai who often listens to English music, 黄明志 or Namewee as he’s known, is one artiste that will perk your head up. I’m no fan, but he has gotten me so curious that I was actually excited to attend his concert at The Star Performing Arts Centre. 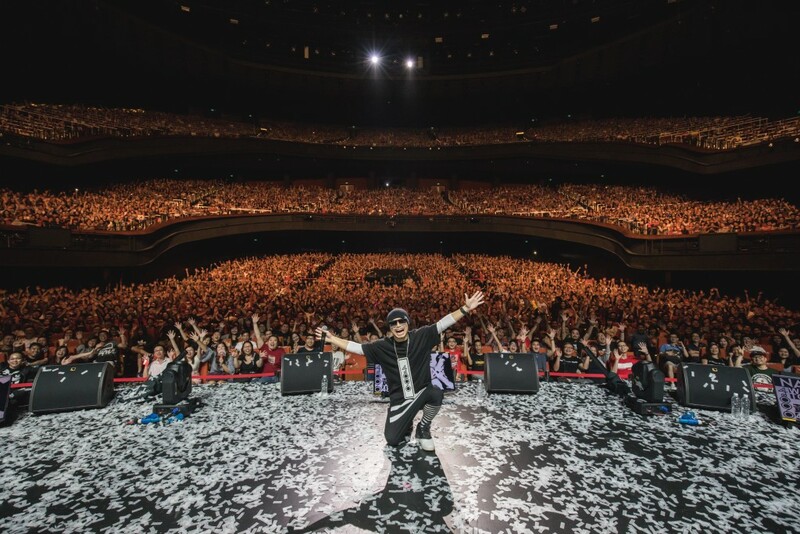 After the opening performance by cutesy Malaysian girl group, Amoi Amoi, the Star Theatre dimmed as multiple large digital screens illuminated, broadcasting a video compilation of Namewee’s ﬂedgling struggles, his numerous controversies and his arrests – a badge of honour he carries about to remind the world of how he started. Finally, the moment everyone was waiting for. 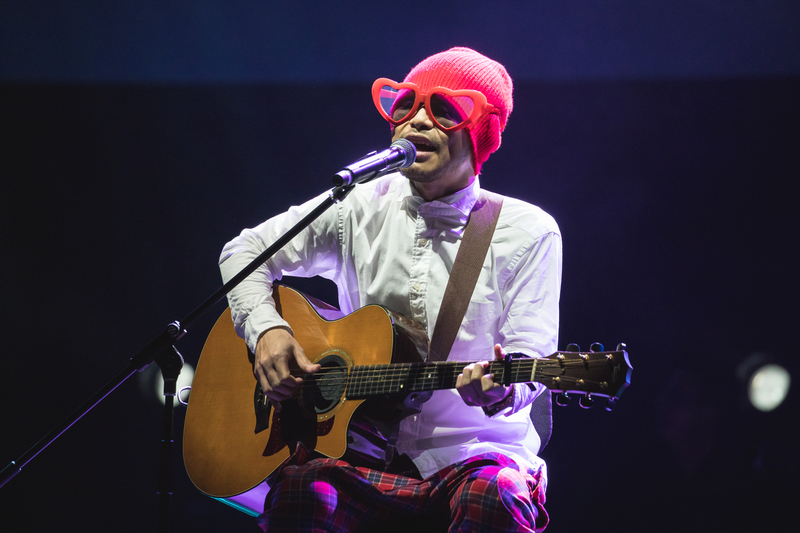 Clad in loose rapper outﬁt and funny-shaped sunglasses, Namewee rapped to the hearty rhythms of his live band, garnering a cacophony of applause and hollers that made the entire atmosphere vibrate with electrifying exhilaration. His female backup dancers added to the dynamism of his performances, which were catchy, upbeat and amusing, despite the lewd connotations in many of his songs that carry a generous twist of light-hearted wit in their lyrics. After his ﬁrst song, Namewee faked a collapse and was dragged away from stage, causing guffaws to erupt. It was the ﬁrst of his many comedic skits that ﬁlled in between his songs. The 5000-strong crowd interacted to every song he performed – singing, clapping, cheering, screaming, waving, middle ﬁnger ﬂashing — you name it. Despite his meteoritic star status, Namewee proved to be pretty down-to-earth. During his entertaining skits, he shared anecdotes of his personal life and spoke to the audience as if they were his friends and they laughed along heartily. In one instance, he donned a red blazer with multiple ﬂags on it to prove his love for his fans from around the world. 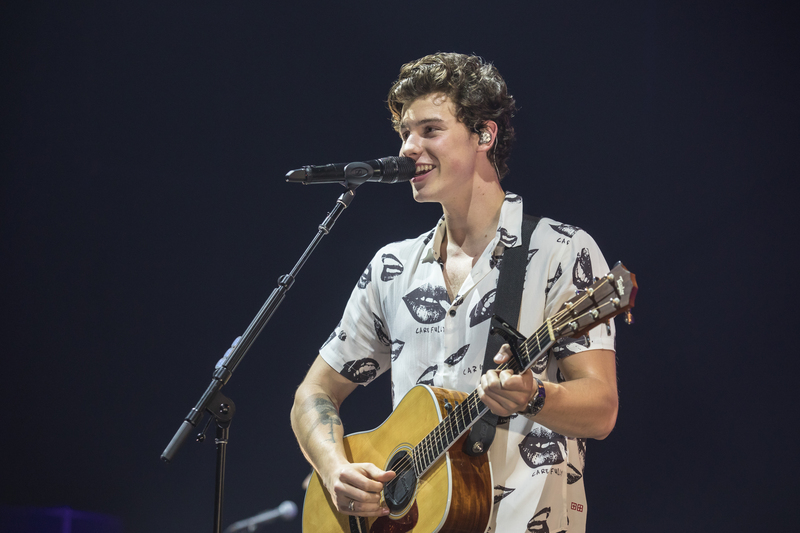 This also tied in to his series of light-hearted songs that have whimsical references to the cultures of Thailand, South Korea, Japan and Hong Kong. And he made sure his Singapore audience felt at home with him when he performed “击败人 (Geebai People)”, and “搞笑快行动 (Funny Action)” with local artiste, Jack Neo. The congregation reacted with a high-pitch roar. The grand momentum was building up. The theatre darkened once again as the screens showed YouTube videos of various fans from around the globe performing covers of his globally acclaimed “漂向北方 (Stranger in the North)”. 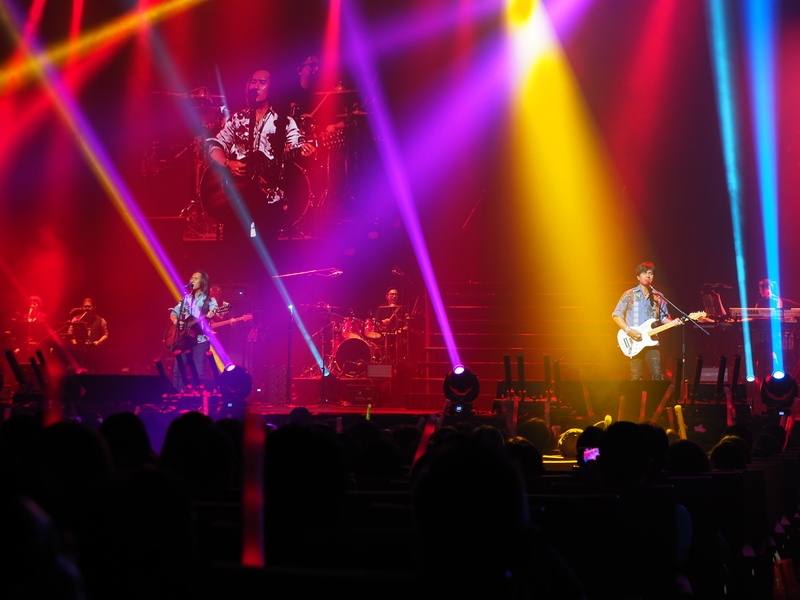 Namewee performed the popular hit with famous local singer and songwriter, Boon Hui Lu, much to the audience’s delight. 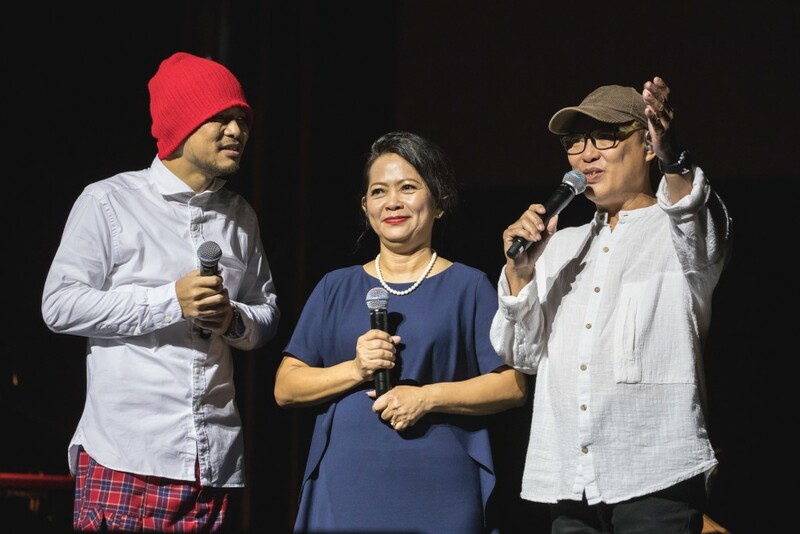 Namewee later revealed his softer, ﬁlial side as he admitted the heartaches and the rebellion that he caused to his parents who were on stage with him, and thanking them for their support. I could literally feel his heart and his past when he sang with his mother “老母 (Mother)”, a touching duet about his mother’s enduring love throughout his life journey. He later invited his father to sing, which he remarked was a ‘gift’ to his dad who always dreamed of singing in front of a crowd. Namewee’s parents expressed gratitude for the fans’ support, reigning in another round of applause. When the concert ended with what was supposedly the last song, the audience refused to leave. The cry for an encore grew louder as voices gathered in unison. Suddenly, the singer-rapper appeared in a video and triggered an exhilarating welcome applause. In the playful video, he asked the audience to scream out loud for their next song request. Namewee and his dancers returned to the stage once more and gave their best to their ﬁnale, “泰国情歌 (Thai Love Song)”, followed by splashes of shiny confetti exploding in the air with more cheers and screams. At his request, Namewee posed for candid photo-taking with the crowd in the background. Lastly, the audience gave a standing ovation for every performer and stage crew as they joined hands with Namewee and bowed to the crowd with their heartfelt thanks and goodbye. I expected a chaotic exit, but leaving was surprisingly convenient and fast as everyone emptied the theatre with ease and in a civilised manner (thanks to the multiple exit points!). Even as I reached the MRT station which was just next door, I could still hear the excitement and nostalgia in the remarks of the passing crowd who continued reminiscing the concert experience. Although I could not appreciate his controversial actions and often ﬂippant lyrics, I cannot deny that Namewee is as real as he gets. He is unabashed in his honesty and in his opinions, and he addresses social ills with satirical humour in both his songs and in his personality.